Cars; there are sports cars, supercars and limited editions. But, just sometimes, there are icons and then, there are the men that drive them. 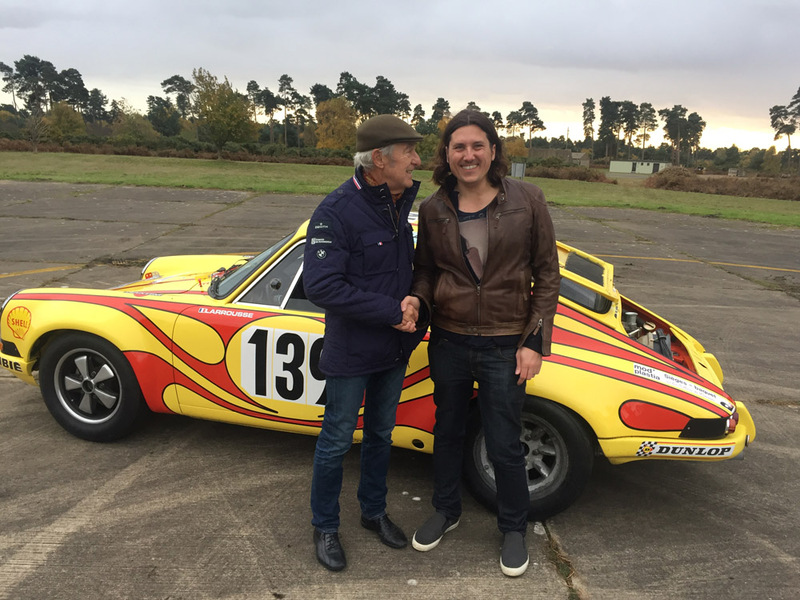 Back in November 2016, I had the pleasure of witnessing the reuniting of Historika’s “Larrousse Tour de France” 911ST with French racing legend, Gérard Larrousse. 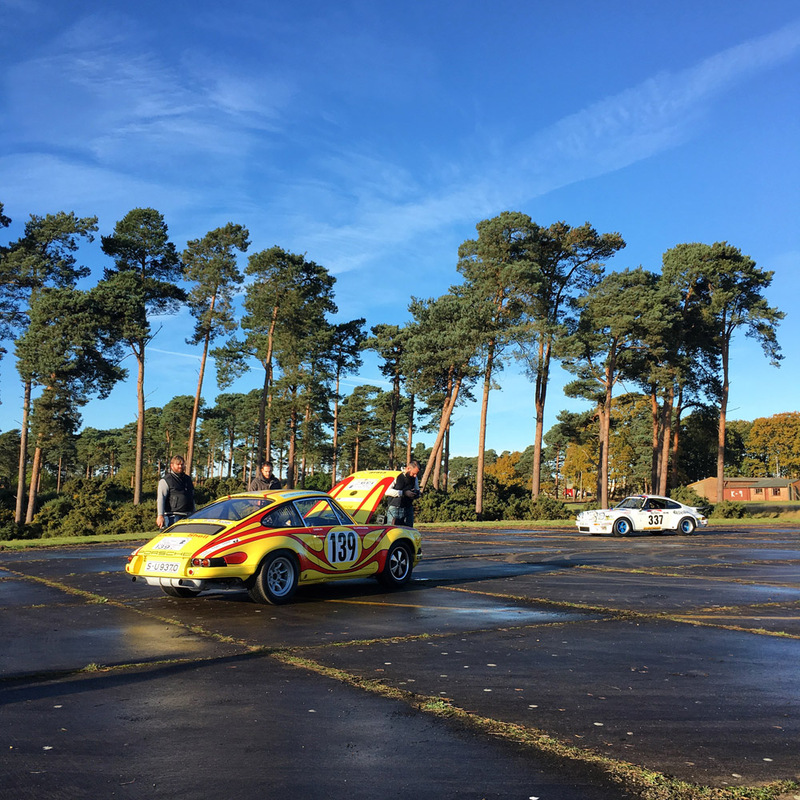 Larrousse began his career in rallying. Winning the French Rally Championship and the Tour de Course in the late ‘60s, followed by several 2nd place finishes in the Monte Carlo Rally. Moving into circuit racing, Gérard successfully added endurance racing wins at the 12 Hours of Sebring and the 24hrs of Le Mans to his impressive career; this was topped by a Formula One entry in 1974. Following his time behind the wheel Gérard went on to manage the original factory Renault Formula One team and later, Larrousse Formula One. 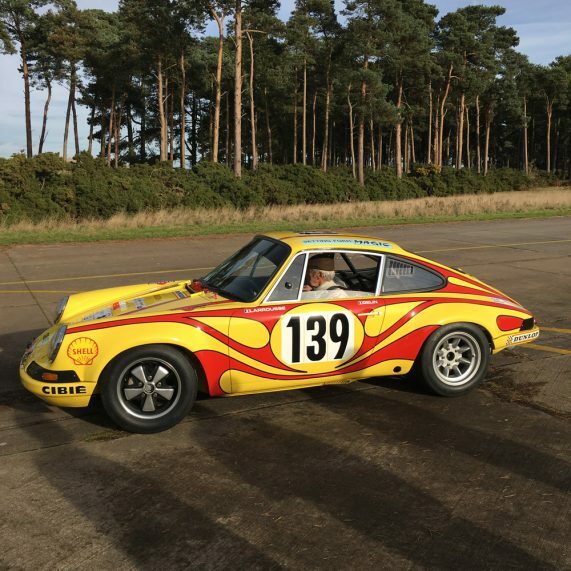 “For over 30 years the Porsche reference books and several “Experts” mistakenly believed that the Porsche Works entry 1970 Larrouse Tour De France car identity was chassis 911 030 0949. This, in many ways, was extremely fortunate, because it seems that there have been more than one example of 0949 in existence in recent years. 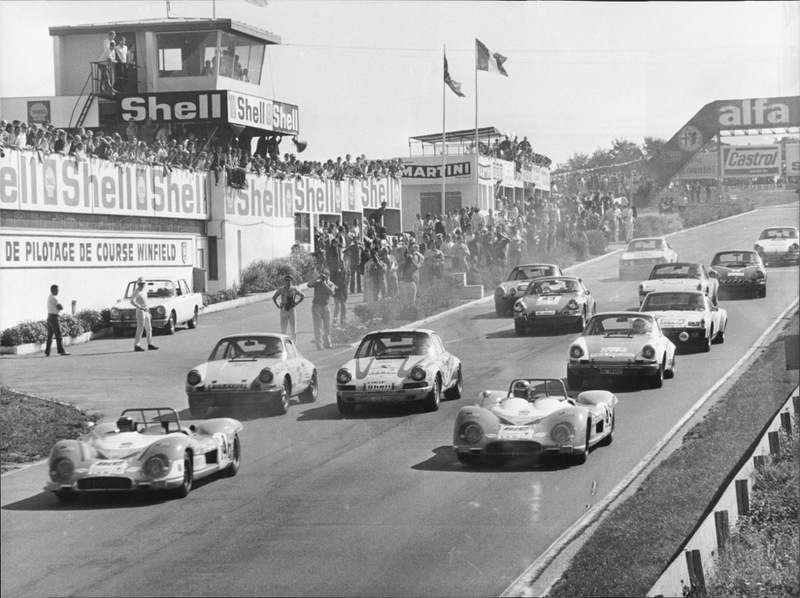 When I first purchased the car I got in contact with the archives department at Porsche Stuttgart. They checked the car thoroughly to prove its provenance and confirm it was the original car. One fantastic story is, apparently one week before the beginning of the Tour de France; Gérard requested that they remove more weight from the car. He did not believe the car was light enough and greater weight saving could still be achieved. Gérard promised a bottle of champagne for each kilogram saved. Having spoken to the retired mechanics that prepared the car, they laughed that they would have received more bottles of Champagne; if they had remembered that they had left fuel in the car on its final weigh in! 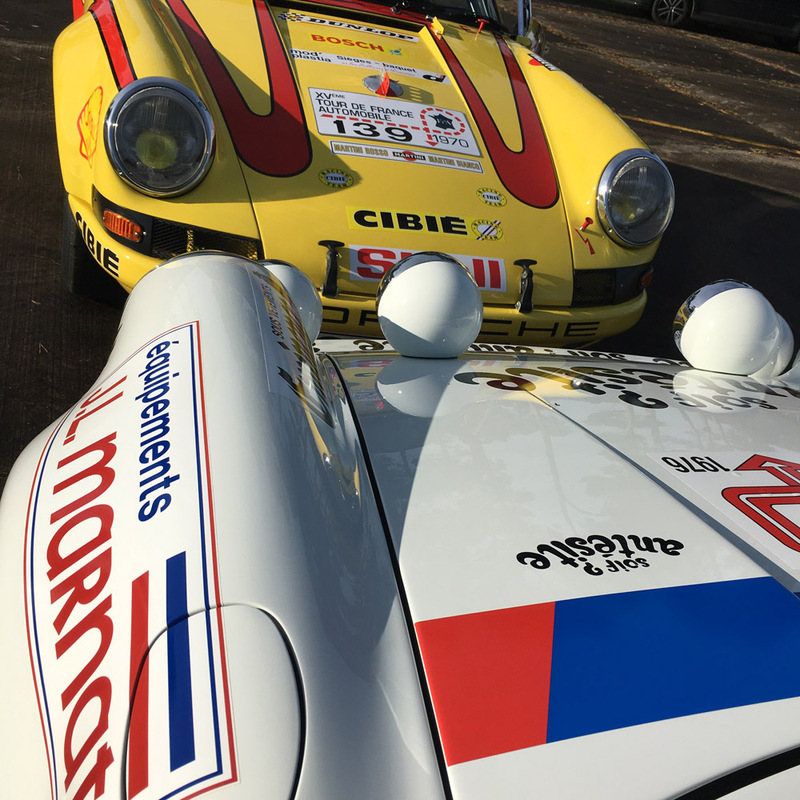 Another great story is the cars journey to a race at Thruxton. As it turns out Wayne Hardman had personally been sent with a car and trailer from the UK to Stuttgart to collect the newly finished 911 with all 2.8 RSR upgrades to the suspension, brakes, gearbox and engine. Wayne had to use his Canadian charm at the Dover ferry border customs and was soon on his way to make good time for the race. However, the trailer suffered a puncture and not to be beaten Wayne took the car off the trailer and proceeded to drive on slick race tyres to Thruxton! Arriving at the circuit unscathed, driving down the hard shoulder to pass all the queuing race fans, he unfortunately arrived too late for race practice and qualification. David Purley was allowed to start from the back of the grid for the race and went on to break the class lap record, only narrowly missing out on the outright win. I just love this story; it’s so typical of racers of the 60’s and 70’s and so refreshingly different to the clinical rules and regulations of the current motor sport world. Over the last 5 years the shell has been totally restored. We even managed to source all original period panels, including a genuine 1970’s ST fiberglass front bumper, bonnet, engine lid and NOS ST fiberglass arch extensions. Unbelievably many of the original parts were still on the car and have survived 30 years of use. The original plastic fuel tank, the leather tyre strap, the very special works competition Weber 46’s and the competition engine parts, such as the race thermostat valve. Seeing this epic car in action was a true treat for the senses, I can still hear the bark of the engine as Gérard pinned the throttle with a determination that belied his 76 years. Getting to passenger ride alongside him as I tried to capture the moment on film will be forever etched on my memory, just watching him deftly heel and toe with style and panache was mesmerising. He was also a true gentleman and genuine character. Thanks for Kevin Moffatt from Historika for the invitation to join them on this epic day and thanks for Gérard for a drive I’m sure to remember.